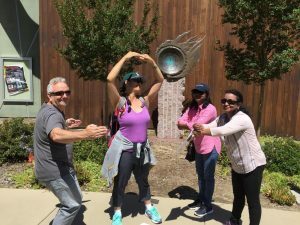 Event Description: A fun, safe and clean outdoor setting for a corporate team building, Downtown Pleasanton is one of the best kept secrets of the Bay Area. History: Located in the East Bay about 25 miles east of Oakland, Pleasanton is a charming, upscale town of about 70,000 people. Once the home of Ohlone Indians, Pleasanton saw great changes upon arrival of the Spaniards, who introduced agriculture and vast herds of cattle. A farming region for the next 100 years, Pleasanton grew along with the Bay Area economy, eventually becoming the home to such corporate headquarters as Safeway Inc., Blackhawk Network, and Ross Stores. Today, Pleasanton is a bedroom community, recently ranked as the wealthiest middle-sized city in the United States by the Census Bureau and number 4 in USA Today’s list of “America’s 50 best cities to live in”. During your corporate team building treasure hunt…expect to encounter a giant Rubik’s cube, a mural of cows, three columns of mosaics, and a photo of one of the great NFL coaches.